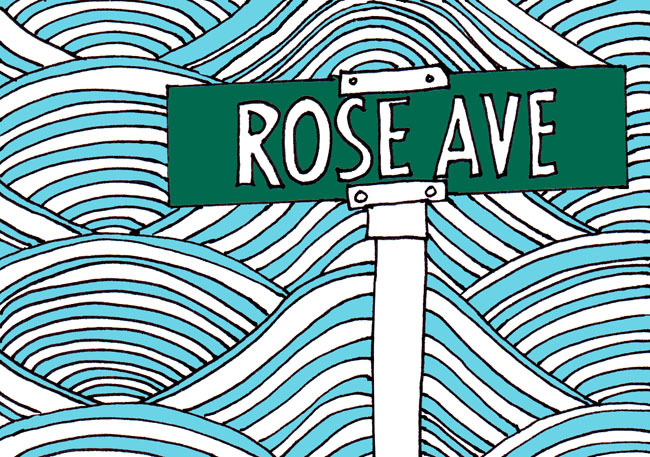 “I can’t believe you didn’t tell me you lived on Rose Avenue,” said Florencia. It was only her first day in the city, but Florencia did, in fact, love it. She herself had liked Rose just fine, but she hadn’t known, not really, that there could be so many people, so much life. And the weather! This morning, still on Nebraska time, she had woken up before dawn and wandered into the living room, watching the light change as the sun rose. It was February, but they hadn’t even had to turn the heater on. And when Jenna stumbled out of her bedroom, barely awake, she had been barefoot. “When in Rome…” said Florencia, grinning right back. With a shock, she realized it was the first time she had smiled for real in as long as she could remember. Over Jenna’s shoulder, VC’s jogging buddy caught Florencia’s eye and gave a rueful shake of his head and a small, “What can you do?” gesture. Later, when Florencia remembered that first moment, she wouldn’t be able to say what had happened. It wasn’t love. It wasn’t even lust. It was, instead, a pure and instant recognition that shot up the back of her knees and into her chest, setting off heat like a chemical reaction. When she had been in LA longer, she would hear people describe this kind of thing by saying, “I must have known him in a former life,” a phrase Florencia refused to utter even when she had lived in Venice long enough to be considered a native. But right now, in this life—the only life Florencia knew for sure she had—she let herself watch the muscular back of the man as he jogged away, and she wondered who he was. At least, until her daughter’s impatience slammed into her like small, pushy hands. Iris wanted to see the beach, and she didn’t want to wait. This was going to be a long pregnancy.